Chris Weinberger was our sales person. My daughter came in to look for a new vehicle, upon inspection of her car, they found that she had 2 of the 4 cylinders blown. Christ would not let her drive away from the dealership. It was a Saturday afternoon late, so he gave her a loaner to drive. Waconia Dodge worked hard to keep her safe. One thing I would recommend is to get the extended warranty. Without this my daughter would have been out over $7,000 for a new engine. After getting the car to the dealership of the car, Chris and Waconia Dodge worked hard to match a deal from another dealership so that she could get into a new vehicle. I have done business with Chris Weinberger on several occasions and he has never missed lead, treated or cheated me. I would highly recommend if you are looking for a vehicle, see Chris Weinberger at Waconia Dodge. 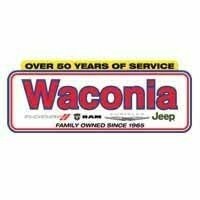 I first started my relationship with Waconia Dodge back in 2006-ish. I own big diesel trucks, and Waconia was one of the only places where the service guys didn't try to talk down to me because I was female. Eric and Steve always treated me with respect, and worked hard to make sure my trucks ran dependably 100% of the time.In 2017 I ordered a brand new truck from Dodge through Waconia. Not only did they give me the best pricing of any dealership around, they worked to make sure all the customizing I requested was done. Waconia does such a great job, I drove 320 miles to buy my new vehicle from them, and likely will again.The truck has almost 50,000 miles on it now, is running beautifully, and has had exactly one repair. They went out of their way to make sure I got every option I wanted, and now I have a vehicle that makes me grateful daily for its power and dependability.I never hesitate to send my friends and family here. I know they will be treated well and with respect. Andy and Dave are two of the nicest managers I have ever met. I would recommend if you are looking for a Chrysler Dodge Jeep Ram to go to this dealership! Very Impressed!!! Always good as usual. But confused as to why I had to pay for stripped out oil pan bolt. Last 3 oil changes were done there. So who stripped it out? Just saying. Service is great though. At Waconia Dodge, Chrysler, Jeep, Ram we have one of the best selections of cars for sale in Waconia. Car dealerships like ours are built on providing customers with the type of experience they want: simple, fast, and easy. We try not to overcomplicate the shopping experience and offer some of our actual Chrysler, Dodge, Jeep, Ram lease offers, on approved credit of course, right on our website. We want you to be able to find a vehicle in the right price range that will satisfy your needs. Our ability to do that in a fun and friendly manner determines whether we are the best car dealership in Waconia or simply another auto dealership. Finding a high quality used vehicle can be complicated. You spend hours and hours looking at listings online, schedule appointments, and may not even fall in love with the vehicle once you see it in person. The best way to save time while used car shopping is to start with a dealership you can trust. Each of our vehicles gets a very thorough inspection before it ever gets put on our car lot. We want our vehicles to be as trustworthy as possible, and provide you with years of service. We welcome you to come see the vehicles we have for sale, and really dive into them before you start taking any car seriously.